President Donald Trump, standing shoulder-to-shoulder with Russian President Vladimir Putin Monday, refused to say whether he believed his own intelligence agencies over Putin about interference in the 2016 United States presidential election. In an extraordinary news conference in Helsinki, Finland, just days after the Justice Department indicted 12 Russian intelligence agents on charges of hacking into the Democratic National Committee and Hillary’s Clinton presidential campaign, Trump instead said both the U.S. and Russia were to blame over deteriorating relations. Here were some of the most stunning moments from a question-and-answer session with reporters that had Democrats and even some Republicans crying foul. 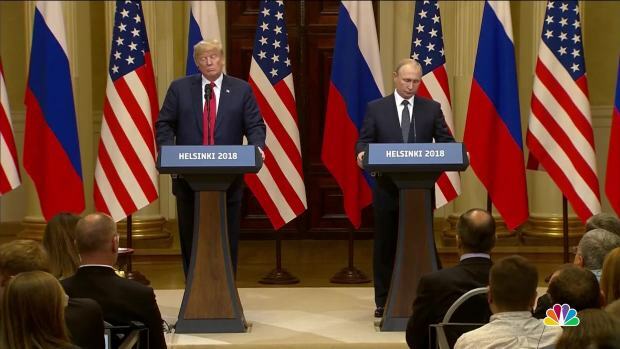 Associated Press reporter Jonathan Lemire asked Trump whether he believed his own intelligence agencies or Putin about whether Russians interfered in the 2016 election and whether he would denounce the meddling and warn Putin against doing it again. In his answer, Trump declined to back his own Justice Department and instead put forward conspiracy theories about the 2016 election and pivoted again to Hillary Clinton's emails. Trump also refused to back U.S. intelligence agencies and noted that Putin had denied Russian involvement. “I don’t see any reason why it would be but I really do want to see the server,” Trump said. Afterward, Daniel R. Coats, the director of national intelligence, said in a statement that the intelligence community's role was to provide the best, fact-based information to the president and policymakers. “We have been clear in our assessments of Russian meddling in the 2016 election and their ongoing, pervasive efforts to undermine our democracy, and we will continue to provide unvarnished and objective intelligence in support of our national security,” he said. The AP’s Lemire also asked Putin directly whether the Russian state had compromising information on Trump, which was the subject of a dossier compiled by a former British intelligence agent and which Trump supporters have denounced. The dossier alleged that an incident involving Trump and prostitutes was secretly recorded by Russia during the visit. Putin called the uncorroborated accusation “utter nonsense” but in waving it off did not specifically deny the claim. Instead he insisted he didn’t know that Trump was in Moscow at the time and said that many American businessmen had visited Russia. Putin was asked whether he wanted Trump to win the election, as U.S. intelligence agencies have maintained. Reporter: Did you want President Trump to win the election? Will Russia extradite indicted Russian agents? Putin was asked whether he would extradite 12 Russian agents indicted for hacking into Democratic computers during the 2016 presidential election. The U.S does not have an extradition treaty with Russia. Putin replied that a different U.S.-Russian treaty calls for mutual assistance on criminal cases and suggested Mueller send an official request asking that Russia question the agents on behalf of the United States. He said that U.S. agents could come to Russia to witness the questioning, if Americans would also assist Russia in its investigation into Putin critic Bill Browder, a British financier who has spearheaded sanctions against Russians for human rights abuses. The 2026 World Cup will be hosted by the United States, Canada and Mexico. Trump said the soccer ball would go to his son, Baron, and threw the ball to his wife, Melania, who was sitting in the audience.